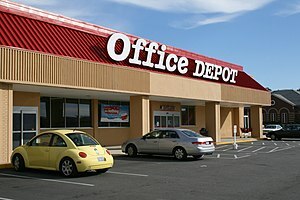 Office Depot (NYSE:ODP) woke up this morning and found that its largest shareholder wants to re-constitute the board. Starboards Value LP have proposed six of their own and want to do it now before the upcoming merger of equals with OfficeMax. Activist shareholder Starboard Value LP is saying the existing board cannot handle the new venture. Office Depot and OfficeMax are clearly also rans in the battles with Staples. So the merger is not a brilliant flanking move but a consolidation and lets hope it works stratagem. W Scott Hedrick 66 is the lead director and has been long serving. Very long serving. Which means he has not provided any differentiating leadership that would have allowed ODP to beat Staples. The corporate blurb says “he brings important institutional knowledge and he has a solid basis for his analysis of our financial strategies” Sounds like he is an excellent analyst. Brenda J Gaines 62 was formerly President and CEO of Diners Club and previously a rising star in Citigroup. So some more financial experience and insight into plastic money and payments. Not a critical skill for a commodity supplier of office supplies. Marsha Johnson Evans 64 is a retired Rear Admiral USN and a human resources type. If you look at the sales associates in Office Depot they did not use the high pieces of her advice. Nigel Travis whose resume lists Dunkin Donuts, Papa John’s, Blockbuster and Burger King is clearly a fast food guy. Not sure how many transferable skills and experiences applied to office supplies. Justin Bateman 38, sits on the board by virtue of an investors rights agreement with BC partners who has a substantial investment stake in ODP. He should have the best ear for take over value. Fogarty, CEO or Orchard Brands, Cynthia Jamison, a board member at Tractor Supply Co.
and David Siegel, CEO of Frontier Airlines. Quite frankly the new replacement players sound way better than the old team.